In a tank in an underground laboratory in Cambridge a little green alga is executing a powerful breaststroke. 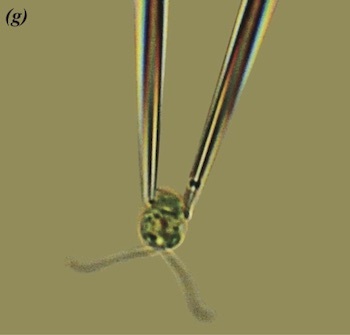 It has a single cell for a body and two hair-like filaments for arms. In another tank algae with four filaments mimic a horse's trot, canter and gallop. Yet others have hundreds of filaments performing a Hawaiian dance to propel their parent cell forward. Amazingly, they manage to do all this even though they haven't got a mind, a will, or anything resembling a brain. The algae are called Volvocales. The lineage contains organisms made up of just one cell as well as ones made up from thousands of cells, which is partly what makes it interesting: it can shed light on why and how multi-celled organisms, including ourselves, evolved from single-celled ones in the first place. Because Volvocales are also easy to find in rivers and ponds, and to grow in the lab, they have long been model organisms in biology. But the lab in question belongs, not to the University of Cambridge's biology department, but to the maths department. "From the point of view of physics and mathematics, Volvocales are interesting because they have a beautiful high degree of symmetry [they are spherical] and they have a fascinating means of locomotion," says Ray Goldstein FRS, Schlumberger Professor of Complex Physical Systems at the Department of Applied Mathematics and Theoretical Physics. "So they are models to study many problems in biological physics and fluid mechanics. Altogether they are model organisms that make everyone happy." One thing that makes Volvocales particularly interesting is that their arms, called flagella, are nearly identical to hair-like filaments called cilia that can be found in the human body. "In the back of your brain, in your kidneys, in your reproductive system, cilia are everywhere," says Goldstein. "An egg goes down a fallopian tube because cilia induce a flow. In the human body you find them executing [something like a Mexican wave]." The flagella of a Volvocale are easier to look at than cilia inside someone's body, so they are a good place to start studying synchronisation. Goldstein and his team started with the simplest member of the lineage - called Chlamydomonas – which consists of a single cell with two flagella attached and is the one that does the breaststroke. Chlamydomonas held in place but still free to move its flagella. Photo: Marco Polin, Idan Tuval, Raymond E. Goldstein. "[To look at Chlamydomonas] we used a technique that comes from the world of in vitro fertilisation," says Goldstein. "We use glass capillaries that have tiny little tips to hold the organism, like you would an egg in IVF." Rather than having to chase it round the container, the researchers could watch it while being held in one place, beating its flagella in vain. Nobody knows exactly how Chlamydomonas beats its individual flagella in a regular fashion, but beat they do. The regularity means that you can treat each flagellum as an oscillator: something that moves periodically like a pendulum. One mechanism that allows pendulums to synchronise has been known since the 17th century. Synchronisation of pendulum clocks was of huge interest back then, as accurate time keeping was essential for navigation at sea. "Christiaan Huygens observed that two pendulum clocks mounted on a flexible support, like a chair or a wall, eventually come into sync," says Goldstein. "He deduced that it was vibrations in the wall or chair that pushed on the two pendulums to make them synchronise." In the case of Chlamydomonas there isn't a wall or a chair, but there is the water in which it lives. A beating flagellum will set the water in motion, the water will then push on the other flagellum, which reacts, and so on. Since the 1950s scientists have suspected that it's the motion of the water that causes the flagella to synchronise. What these scientists were lacking, however, was the technology to properly observe the micro-swimmers, which has only been around since relatively recently. Goldstein and his colleagues used high-speed video microscopy to observe the tiny organisms, together with a clever trick. If you imagine yourself doing a breaststroke while being held in place by giant pipette, you'll notice that your elbow will trace an elliptical shape (like a squashed circle). The same goes for a point on a flagellum: it also traces out an elliptical shape. If something is moving around on an ellipse, then you can describe its location at any given moment in time by an angle (see the figure below). Measuring this phase angle over time for each flagellum told the researchers exactly when, and for how long, the flagella were in sync. 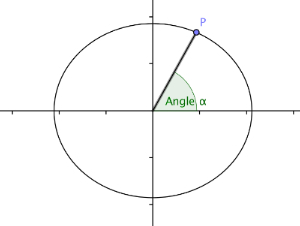 Each point on an ellipse is given by an angle. The data showed that the two flagella of a single Chlamydomonas are in sync only 85% of the time — that's when the cell is doing a breaststroke, swimming straight ahead. The fact that the flagella are out of sync the rest of the time means that, overall, Chlamydomonas is performing a run and turn motion, with straight runs interrupted by sharp turns. Using further experiments Goldstein and his team established that, all in all, Chlamydomonas is performing what mathematicians call a random walk. This way of moving may have evolved for a good reason. If you are looking for food, or perhaps trying to evade a predator, then always swimming straight ahead isn't your best option. You'll miss all the food that swims pass to your sides and a predator will have an easy job of snapping you up. "This is the same thing that bacteria do. And with bacteria it's established, without a shadow of a doubt, that it is part of a search strategy." The data showed that the two flagella of a single Chlamydomonas are in sync only 85% of the time, possibly for good reason (see the box). To address the question of synchronisation the researchers turned to maths. In 2008 a German team of researchers had developed a simplified mathematical model of how the flagella interact with the water around them and, through the water, with each other. In the model the flagella are represented by small spheres that move around an elliptical orbit. This simplification may seem drastic, but studies of how water flows around Chlamydomonas have shown that it's justified. "Rather than considering the entire [flagellum] just replace it with the little sphere going around in an orbit," says Goldstein. "You can calculate the fluid mechanics of this a lot more easily. You have two of these spheres talking to each other [through the fluid] and you imagine that there is a little spring controlling how far they are from their centres. Then you turn the mathematical crank, and, amazingly, you end up with an equation that was developed decades ago by Robert Adler to describe coupled oscillators in electrical engineering." The team estimated the parameters in the model using their cleverly extracted data and came up with an interesting result. "We established that the interaction between the two flagella was of a magnitude that is consistent with the idea that it was fluid mechanical coupling," says Goldstein. This was the first experimental support for the idea that fluid flow alone can cause the flagella to synchronise. But only because the dynamics of the water can cause the flagella to sync, doesn't mean it is the only factor play. After studying the theory Goldstein and his team returned to experiment, this time looking at mutants: organisms that are just like Chlamydomonas in many ways, but have some deficiency or another. "If you look [at Volvocales] very carefully, using electron microscopy, you discover that there is a whole set of filamentary connections [between the flagella] hidden from view beneath the cell membrane," explains Goldstein. One type of mutant he and his team looked at was missing exactly those connections. "It turns out that almost 100% of the time [in this mutant] there is no synchrony at all between the two flagella," explains Goldstein. "The only cases in which there is occur when [the flagella] are very close together. This led us to think that it's not quite as simple as just fluid mechanical coupling; that probably there are [filaments] playing a role too." More complex organisms that naturally have more than two flagella, and that do have the filamentary connections, confirmed this. "One of them, called Tetraselmis, has four flagella and a beat pattern that is remarkable," says Goldstein. "The patterns of beats are in a one -to-one correspondence to [that of] terrestrial quadrupeds like horses: you can have different types of gallops and canters, and so on. The fact that there is a lot of study of the cross-connection inside the cells allowed us to see whether the symmetry of the beating reflects the symmetry of the connections — and it does." Algae going through their paces. The one showing the transverse gallop is Tetraselmis. Movies: Kirsty Wan and Raymond E. Goldstein, see this paper. "So the picture we finally have is that, yes, fluid mechanical interaction can synchronise flagella, but the internal connections play an equally important role. So it's a combination of the two." The work of Goldstein and his colleagues has done more than shed light on Chlamydomonas. It has also formed an experimental and mathematical basis for studying other hair-like appendices, including the cilia inside the human body. "In our body there are situations in which one has large cells with many cilia very close together, with one cell separated by a long distance from the next cell. What we have come to understand is that the synchrony that is observed within one of those cells is hydrodynamically driven, as is the synch observed between it and the next cell along. But when one has, as in fallopian tubes, carpets of cilia there can also be cross-connections between the bases. So [in this case] it's always a combination of the two." 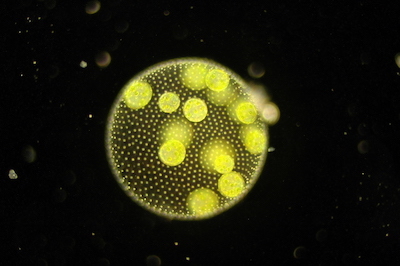 This photo shows a multi-celled Volvocale called Volvox. It turns out that flagella also play a role in that crucial evolutionary step from single to multi-celled organisms. Two things every living thing needs to accomplish are nutrient uptake and waste removal, which in Volvocales happens through the surface of the body. Because of the spherical shape of that surface it's easy to calculate the rate at which Volvocales achieve both. "As one gets to larger and larger organisms, had these organisms had no flagella and no ability to stir the fluid [they live in], they would have reached a bottle neck where their metabolic needs would have exceeded what could come in from the surroundings by diffusion." Having the flagella is what allows Volvocales to bypass this evolutionary bottleneck and become larger. "This taught us that the fluid mechanical flows play a role in the evolution from single to multi-celled organisms." Results like these give essential glimpses into the workings of evolution that ultimately resulted in the dazzling variety of life we see today. Who knew that little green algae have so much to give? Ray Goldstein FRS, is Schlumberger Professor of Complex Physical Systems at the Department of Applied Mathematics and Theoretical Physics at the University of Cambridge. He talked to the Plus team in March 2019.